Stand for Law Enforcement! | Enforce Immigration Laws! Illegal immigration is out of control in this country. Everyone knows that. Well, the State of Arizona is attempting, as is its right, to get control over its own borders and protect its own citizens. To do so, it has passed SB1070, a law that enjoys overwhelming support by Arizonans and all Americans. And yet the Obama Administration, rather than help Arizona, has decided to sue Arizona in an effort to have SB1070 declared unconstitutional. Why? Because the Obama Administration and its allies—the Mexican government and various left-wing open borders groups—do not want this country’s immigration laws enforced. Well, Mr. President, we do! 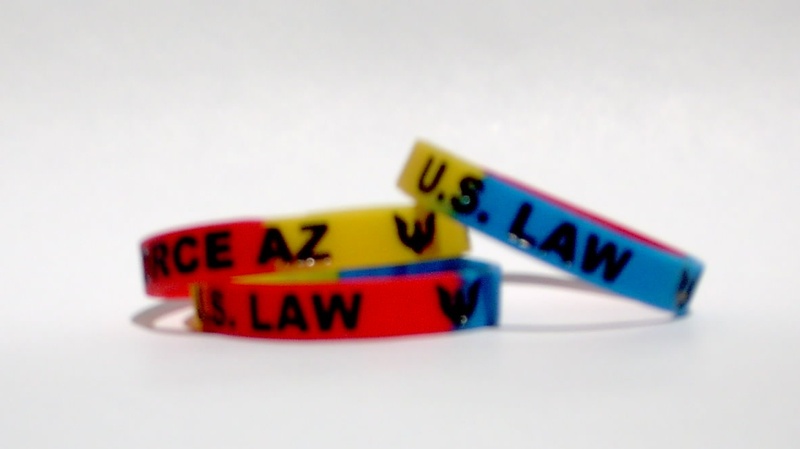 Stand with us and show your support for Arizona by purchasing an “Enforce AZ / U.S. Law” wristband and we will donate a portion of the proceeds to support Arizona in its defense of legal challenges to SB1070. 1 Response to Stand for Law Enforcement!